CBS was a huge beneficiary of Tiger Woods winning the 34th Masters. They were on the air for 10 hours on Sunday because the final round was moved up due to possible inclement weather. CBS started at 9 a.m. EDT and had six hours of live coverage followed by a four-hour recap show. Jim Nantz was told by the late Ken Venturi after Jack Nicklaus’ 1986 Masters win that he would never see a day like that around Augusta National again. 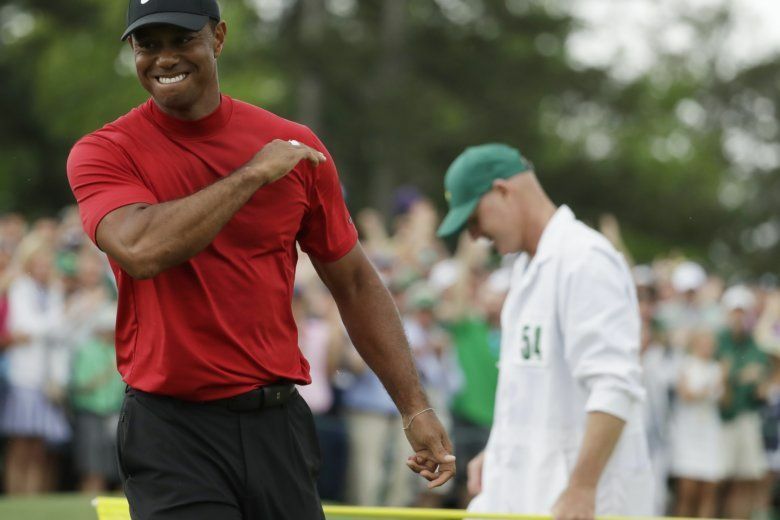 Nantz’s 34th Masters ended up being just as dramatic with Tiger Woods’ first victory in a major in nearly 11 years and his first green jacket since 2005. “I think as far as pure elation and emotion, the scene around the 18th was the greatest thing I’ve ever been an eyewitness to,” Nantz said after Sunday’s broadcast. Nicklaus’ win was Nantz’s first year with CBS as he was calling the action on the 16th hole. He moved to the host role three years later and has had a front-row seat to nine of Woods’ wins in a major. CBS was a huge beneficiary of Woods’ win. They were on the air for 10 hours on Sunday because the final round was moved up due to possible inclement weather. CBS started at 9 a.m. EDT and had six hours of live coverage followed by a four-hour recap show. Director Lance Barrow said he found out about the early broadcast before going on the air Saturday. CBS sports chairman Sean McManus said that despite the time change, it still had the feel and drama of a final round at Augusta. “During huge events like this, everyone steps up. I am very proud of what we did and it was a great broadcast,” McManus said. When it comes to signature victories, Nantz noted there were plenty of differences between Woods’ victory Sunday, his first win in 1997 and Nicklaus’ rally. In 1997, Woods had a nine-shot lead going into the final round with the only drama being if he was going to break the tournament’s 72-hold scoring record. Nantz said broadcast that day was more about storytelling and celebrating the social significance of Woods’ first major. Nantz, along with Barrow and director Steve Milton, did a great job of letting the images of Woods celebrating with his family tell the story. Nantz was silent for 2 minutes, 42 seconds between the time he said, “the return to glory” after Woods sank his putt on the 18th hole and his family accompanying him back to the clubhouse. Barrow also had the clip of Tiger hugging his father Earl after the 1997 Masters ready to go once the moment presented itself. Barrow and Milton also captured a prescient moment when Francesco Molinari was walking up to the 12th tee with a two-shot lead but looked nervous. Molinari’s tee shot would go into the water and opened the door for Woods. What also made the day unique for Barrow and the crew was that they immediately got to relive the moment by doing the encore show. A highlight of that show was Woods coming back to do a second interview at Butler Cabin with Nantz and Sir Nick Faldo. Barrow said CBS executive producer Harold Bryant mentioned that it would be great if they could get Woods again. Barrow called a representative from Augusta National. A couple minutes later, they called back and said Woods would be there in five minutes.